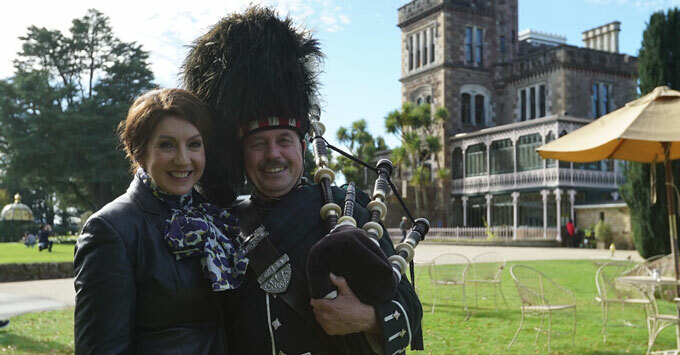 (11 a.m. BST) -- The fourth series of "Cruising with Jane McDonald" starts this Friday, June 8th, with Jane heading Down Under on Holland America Line. This Friday's show will see Jane take the first part of a 14-night cruise on Noordam, visiting Sydney, Tasmania and then New Zealand. The four-part BAFTA Award-winning series has a different format from the previous three series, featuring two lines -- the other is Silversea -- across four episodes (two episodes each), rather than one line per episode. In episode one, Jane starts her adventures in Sydney, visiting the Opera House on a backstage pass. The next stop is Hobart, Tasmania, where she visits a wildlife sanctuary and has a close encounter with a cheeky wombat. The she sets sail for New Zealand, stopping first at Dunedin and then on to Christchurch, which was devastated by an earthquake in 2011, killing 185 people. And finally, she visits Picton in the heart of Marlborough, New Zealand's wine growing area, and samples a glass (or two) of the local wines. Carly Perkins, marketing director at Holland America Line, said: "Holland America Line was delighted to host Jane McDonald and the Channel 5 film crew for a second time to showcase our classic style and enriching journeys, this time cruising from Sydney to Tasmania and around the highlights of New Zealand on the beautiful Noordam." Jane also visits South America on a two-week cruise on Silver Muse, which broadcasts on June 22nd. She visits Valparaiso, Chile, before making her way around the bottom of the continent to the Falkland Islands. Along the way, she stops in at various Chilean ports, sees glaciers and icebergs and visits Punta Arenas, the Southernmost city in Patagonian Chile. Cruising with Jane McDonald starts Friday, June 8, at 9 p.m. on Channel 5.